The economic figure would far exceed US spending in Pakistan and underscores China’s economic ambitions in Asia and beyond. 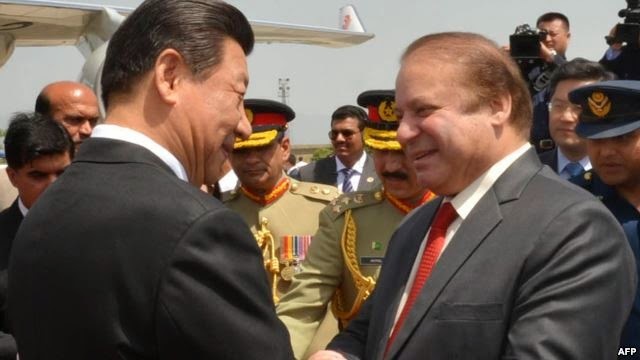 Islamabad had a busy day, because of Chinese President Xi Jinping arrived in Pakistan to launch projects linking the allies worth US$46 billion. President Xi Jinping promised to build roads, ports and power plants on the first visit by a Chinese head of state to Pakistan in almost a decade. Xi and Prime Minister Nawaz Sharif witnessed the signing of 51 pacts on Monday, including an ''All-Weather'' strategic partnership that seeks to formalize longstanding defense ties between the nations. The agreements signed were valued at $28 billion, according to Pakistani Planning Minister Ahsan Iqbal. The infrastructure and energy projects are aimed at establishing a Pakistan-China “economic corridor” between Pakistan’s southern Gwadar port on the Arabian Sea and China’s western Xinjiang region. Pakistani Parliament defense committee chairman Mushahid Hussain Sayed said, the plan is part of China’s aim to forge “Silk Road” land and sea ties to markets in the Middle East and Europe, and reflects a shift of economic power in the region to China. “Pakistan, for China, is now of pivotal importance. This has to succeed and be seen to succeed,” he added. A network of roads, railways and pipelines, is to pass through Pakistan’s poor Baluchistan Province, where a long-running separatist insurgency, which the army has again vowed to crush, will raise doubts about the feasibility of the plan. Recently 20 laborers were killed by extremist separatists. The security of Chinese workers is a prime concern for Xi. In talks with Mr. Sharif and military leaders, Mr. Xi is also likely to raise China’s fears that Muslim separatists from Xinjiang are teaming up with Pakistani militants. “Our cooperation in the security and economic fields reinforce each other, and they must be advanced simultaneously,” Xi said in a statement to media on the eve of his two-day visit. Xi is expected to call for greater efforts to bring peace to Afghanistan, where Pakistan is keen to restrict the influence of its rival, India. China is set to provide up to US$37 billion in investment for the energy projects to generate 16,400 megawatts of power, Pakistani Minister for Planning and Development Ahsan Iqbal said. Concessional loans are to cover nearly US$10 billion of infrastructure projects. The US has given US$31 billion to Pakistan since 2002, according to the US Congressional Research Service. About two-thirds was earmarked for security. If realized, the investments will help Mr. Sharif to revive Pakistan's economy, which suffers from chronic power failures and an insurgency that has killed more than 50,000 people since 2001. Mr. Sharif has received a loan from the International Monetary Fund but if he fails to do so the biggest opposition of the time will lead to more distress for Sharif’s government. On the other hand there was high security alert in Islamabad and people’s life was affected a lot. Social media saw a huge trending of Chinese President’s arrival and media channels gave full coverage to the event.